Leading Swiss hospitality management institution Glion partners with top-ranked French business school to offer a unique MBA degree combined with an MSc in International Hospitality Business degree. Students will obtain a graduate degree to manage hospitality companies, together with the strategic skills of an MBA to become the leaders of tomorrow. “We are proud to partner with Grenoble Ecole de Management to (GEM), a triple-accredited institution to offer this dual-degree program. Students will obtain a Master of Science in International Hospitality Business, a graduate degree that transfers all the necessary skills for managing business operations and people in hotels and hospitality companies, together with the strategic skills of an MBA to become the undisputed leaders of tomorrow,” said Georgette Davey, Managing Director of Glion Institute of Higher Education. “Our MBA program at GEM stands out for its internationality and its emphasis on well-rounded professional development. Together with Glion’s long-standing hospitality expertise and tradition of excellence, we will be able to deliver a stimulating double-degree program with a rigorous academic curriculum that directly applies to the dynamic hospitality industry,” said Phil Eyre, MBA Program Director at Grenoble Ecole de Management. This academic innovation reflects Glion’s commitment to best equip students for employment and anticipate latest trends of the travel & tourism industry, which is expected to create an additional 90 million jobs by 2027. Glion Institute of Higher Education (GIHE) is a private Swiss institution that offers international hospitality, luxury and event management degrees to students from over 90 different countries across three campuses in Switzerland and London, UK. Glion is accredited by the New England Association of Schools and Colleges, Inc. (NEASC) and ranked among the world’s top five higher education institutions for employer reputation in hospitality management (QS World University Rankings 2017). 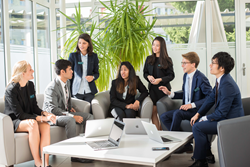 Together with Les Roches Global Hospitality Education, Glion is part of Sommet Education, a newly-formed hospitality education group owned by Eurazeo, one of the leading listed investment companies in Europe. For the past 30 years, Grenoble Ecole de Management (GEM) has developed its role in France and abroad as a leader among French business schools to help shape the future of business around the world through our expertise in technology, innovation and entrepreneurship. The MBA program at GEM provides an intensive practical program with a focus on the challenges of management and key operational concepts. Its mission is to provide future managers with the core knowledge needed to adopt a holistic view of business and stimulate managerial and entrepreneurial initiative.